Abstract - The Uptime Institute has released the latest version of the Tier Standard: Operational Sustainability effective 1 April 2013. The updates to the Standard are the result of discussions and voting by the Owners Advisory Committee. The Committee consists of those organizations that have successfully achieved Tier Certification. The changes to the Standard reflect the experience of those organizations completing certification and the experience of the Uptime Institute. Mostly administrative in nature, the changes to the Standard removes the bonus behaviors (they were eliminated or became required for Tier III and/or Tier IV) and removes the Operational Sustainability Rating Section. The current Gold, Silver, and Bronze Operational Sustainability ratings are still applicable for Certification. 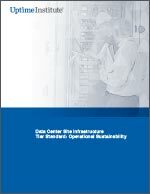 Uptime Institute's Tier Standard: Operational Sustainability establishes the behaviors and risks beyond the Tier Classification System (I, II, III, IV) that impact long-term data center performance. This Standard unifies the site management behaviors with the Tier functionality of the site infrastructure in order to achieve the organization's business objectives or mission imperatives.